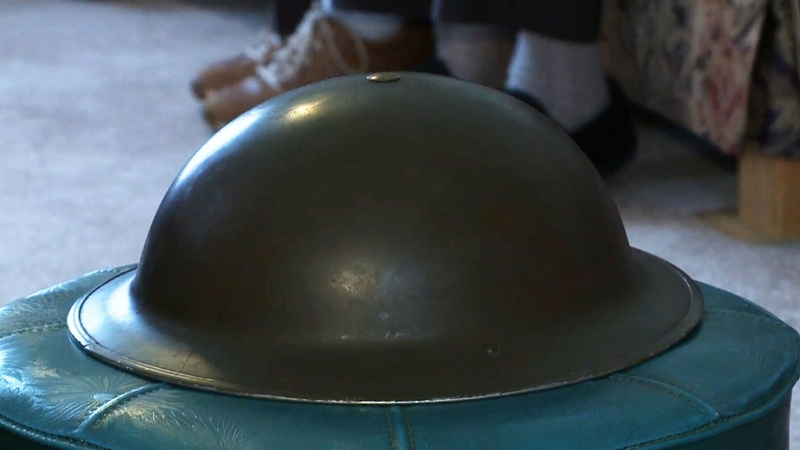 An old war helmet is back in the hands of a Canadian collector, after the Second World War veteran who was recently reunited with it passed away last month. War veteran George Johnston died last month at the age of 94, one year after he was reunited with the military helmet he lost at the end of the Second World War. But that helmet will remain in caring hands, after Johnston decided it should be given back to the man who returned it to him. That man is Jordan Chiasson, a New Brunswick war relic collector who purchased the helmet at a Moncton surplus store last year. He'd planned on adding it to his collection, but a name and inscription on the hat prompted him to track down Johnston and return it. The two men lived in the same town, so it wasn't a difficult task. 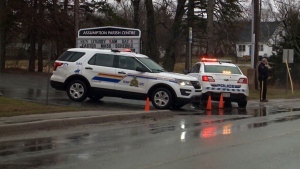 "At the beginning, I just wanted to see who it belonged to," Chiasson told CTV Atlantic this week. "As soon as I found that he was alive, this got more personal." What followed was a brief but strong friendship that lasted until Johnston died. Johnston's wife, Annie, says her husband "took a great liking" to Chiasson, and trusted him to protect the helmet after his death. "He thought it would be taken care of with Jordan," Annie Johnston said. Chiasson accepted the helmet at a tearful presentation during Johnston's recent funeral. "Right at the end, the last five minutes of the funeral, they presented the helmet to me," Chiasson said. "I was crying. Everyone was crying." Johnston wore the helmet when he stormed Juno Beach with Canada's North Shore Regiment on D-Day, 1944. He wore it through battles in Belgium, France, Britain and the Netherlands. He wore it until the end of the war, and when he came home to New Brunswick, he lost it in the excitement of the post-war celebrations. How it wound up at a Moncton surplus store is anyone's guess, but when Chiasson gave it back, it brought joy to the last year of Johnston's life. "I can't explain what it feels like to have that hat back," Johnston told CTV News last year. "I never thought I'd see it." Chiasson says he will take good care of the helmet for his friend. "It tugs at my heart," he said. 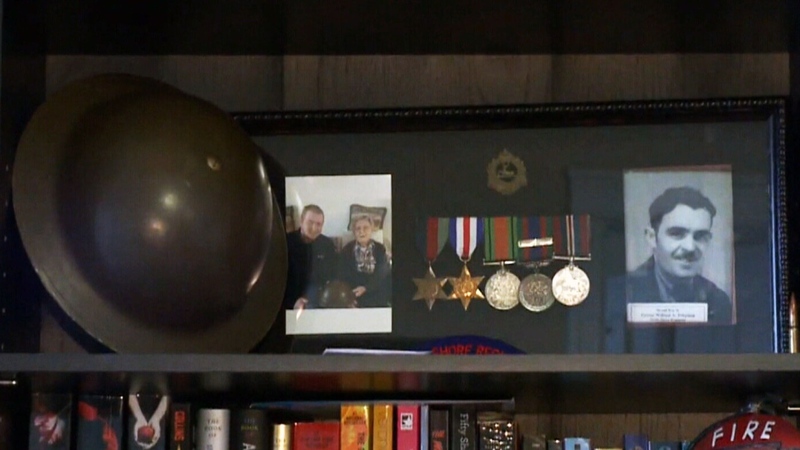 Former soldier George Johnston's war memorabilia is shown at the home of history buff Jordan Chiasson. 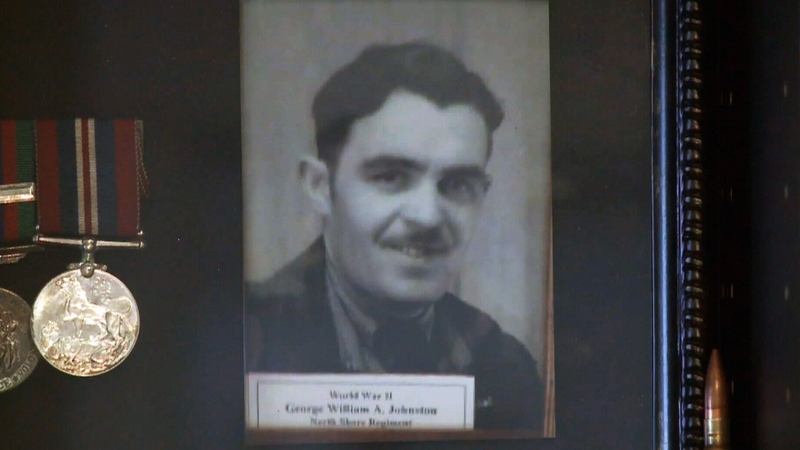 George Johnston was separated from his Second World War helmet for almost 70 years.